Some of the volunteers joined James Morris, NOAA ecologist, to clean up debris from the water. In November, 52 volunteers helped the North Carolina Coastal Federation clean up marine debris near Harkers Island and at Wards Creek Bridge in Bettie. Both cleanups were part of a grant to clean up a former clam-growing operation that went out of business decades ago. 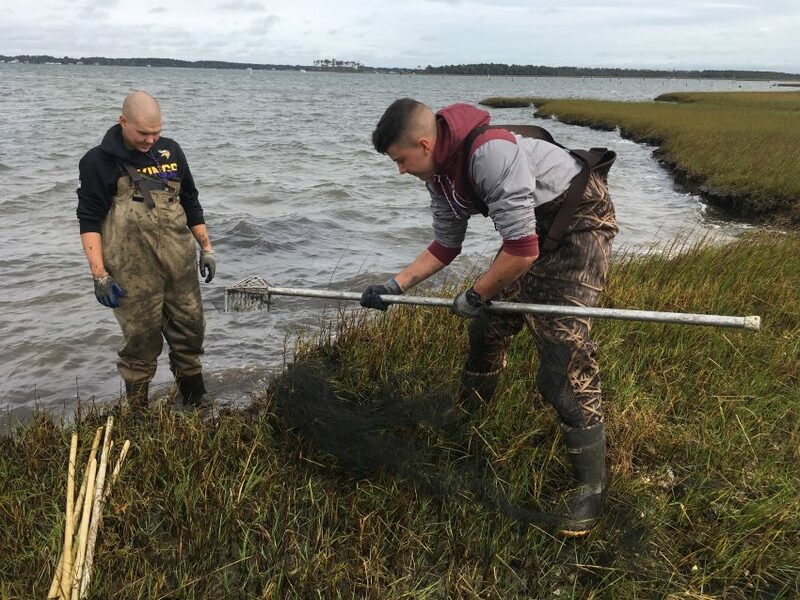 Plastic netting, cages, buoys, pipes and ropes are creating navigation hazards, and are littering salt marshes, seagrass beds and oyster beds. Over the years, storms have caused this trash to end up on shorelines and in salt marshes. The first cleanup was on the cold, windy afternoon of Nov. 13. 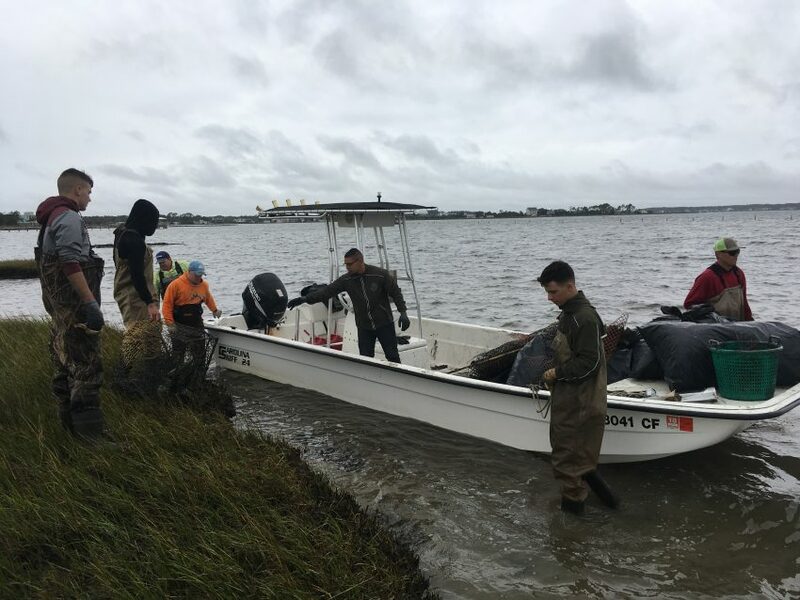 Twenty-two marines from Marine Corps Air Station Cherry Point volunteered to help the federation pick up approximately 3,000 pounds of marine debris at the former clam-growing operation near Harkers Island. The volunteers stayed along the shoreline and picked up plastic mesh, sandbags, PVC pipes and large wood as part of the cleanup. Some of the volunteers joined James Morris, ecologist for NOAA, on a boat to collect pilings and piping that was in the water. Because of the hard work of the volunteers, the group removed most all of the debris off the shoreline. Marines clean up netting from the shoreline at the old clam-growing operation. Brooks Dredging and Marine Construction Inc., which also provided a barge for this cleanup, will be cleaning up the remainder of the debris on the shoreline and in the water. Duke Marine Lab will use drones to collect data on the marine debris that is still present in the water. Additionally, they will collect data at the site over the next year on marsh and sea grass recovery. The second cleanup was held at Wards Creek Bridge on Nov. 27 and brought in 20 volunteers. The federation partnered with the Croatan Group of the North Carolina Sierra Club for this event. The group picked up 2,625 pounds of litter. Some interesting finds included a TV, a power tool and even a speed limit sign. “The volume of debris collected during these two cleanups would not be possible without our partners and volunteers, and I hope that they will continue to join us and help keep our shorelines and waterways clean and healthy,” Tillett said. The federation will continue to hold cleanups in Carteret County as part of this grant.